Born in Lenno Tremezzina (Como) in 1945. Master in Mechanical Engineering at Politecnico of Milan in 1969. 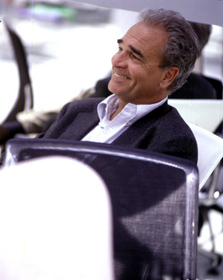 From 1973 to 1979, technical manager of Kartell. In 1979, he starts as a freelance industrial designer for various companies; Alfa Romeo Auto(1981-1986) etc. From 1983 to 1987, lecturer on industrial technology at Domus Academy. Since 1994, the Museum of Modern Art in New York includes in its Design Collection; “Light light” chair in 1987, “Soft light” chair in 1989, “On-Off” lamp by Luceplan in 1988, and “Longframe” by Alias in 1993. Meda Chair(Vitra) was awarded I.D design review – ‘Best of category’ in 1997, ‘Good design Gold Prize’ of Japan in the next year. A personal exhibition at Salon du Meuble in Paris in 1999. In 2003, he was awarded Reddot award for Iittala Knives.